There was no one moment when Manchester United's season began to sink. It was afloat in October and November, and even for much of December. But with the new year approaching, a busy holiday period has seemingly put United under. A 0-0 draw with Southampton on Saturday was the latest shortcoming. United failed to unlock a Saints defense that was locked, but not exactly bolted shut. Its top scorer, Romelu Lukaku, was stretchered off early in the first half with a scary head injury . United is now winless in four matches, and slipped out of the Premier League's top two for the first time all season. Suddenly, everything is going wrong. The Red Devils looked to have gone ahead late against Southampton. Nemanja Matic scraped a loose ball toward the far post. It appeared destined for the corner of the net. But Paul Pogba, standing in an offside position when the ball left Matic's foot, stabbed the ball over the line rather than letting it run. Such is life for Man United in free fall. A reserve Red Devils side, with regulars sprinkled in, was knocked out of the League Cup by Bristol City last week. 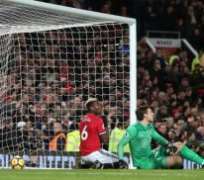 The first-stringers then conceded a 94th-minute equalizer at Leicester two days before Christmas, and gifted an “S goal,” as Jose Mourinho called it, to Burnley in a disappointing 2-2 draw at home. The unsaid, explicit translation of “S” didn't take too much brain power to deduce. And it didn't just apply to Burnley's scrappy opener. It has applied to United for a while now. Once seen as a title contender on the back of rampant early-season wins, the lesser of the two Manchester teams has been well below expected levels for a while now. United's slide could, and probably will, be temporary. But it is not the case of a few isolated instances of misfortune. It is an accumulation of sub-standard performances. The warning signs appeared in one-goal wins over Bournemouth, Brighton and West Brom. Results protected the swelling truth that United was rather ordinary. Over two weeks either side of Christmas, that truth has been exposed. And now Lukaku could be out for some time. He clashed heads with Southampton center back Wesley Hoedt in the eighth minute, shortly after missing a glorious chance to put United ahead. He received roughly six minutes of treatment on the Old Trafford pitch. He was eventually stretchered off , with an oxygen mask over his face. With Zlatan Ibrahimovic out for a month, according to Mourinho after the match, United's forward line has, abruptly, become alarmingly thin. Its midfield is crying out for some creativity. And the back six – defensive midfielders and defenders – have been disjointed for months. Connections have been ruptured by injuries to Pogba and Eric Bailly, the latter of whom remains out. Marouane Fellaini has also missed the majority of the season due to injury. Antonio Valencia and Chris Smalling both missed Saturday's match, and deputy left back Ashley Young could be suspended for an elbow to the stomach of Shane Long. It isn't just up top; United's entire squad, by Big Six standards, is looking threadbare. United remains in third place, momentarily seven points clear of fifth. Based on the past two weeks, though, and even on the past two months, it looks like the sixth best team in the Premier League. And halfway through year two under Mourinho, it isn't getting any better; it's getting worse.